Acer introduced a number of new products today including an Android smart phone and an e-reader. 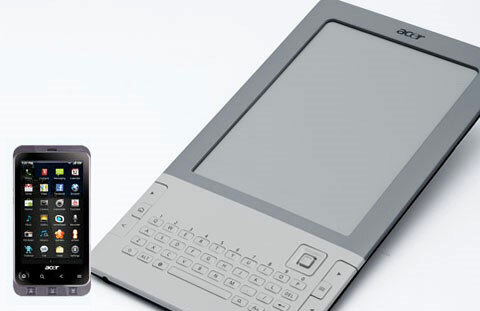 The e-reader will offer free Wi-Fi, 3G connectivity options and will work with Barnes & Noble’s e-book library. The Android phone known as the Acer Stream will run Android 2.1 (though it’s sure to be upgradable upon release), has a 1 GHz Snapdragon processor and 3.7-inch WVGA AMOLED touch screen. Prices and release dates for both devices haven’t been announced, but the Acer Stream was recently cleared by the FCC, which indicates that it will be available in the U.S.